CAAP’s Operation Rescue Coordinating Center said aside from the grounded Cebu Pacific flight, the airline’s turnaround Manila-Butuan-Manila flights 5J 785 and 5J 786, and another Cebu-Butuan-Cebu roundtrip, 5J 223/5J224, were cancelled. 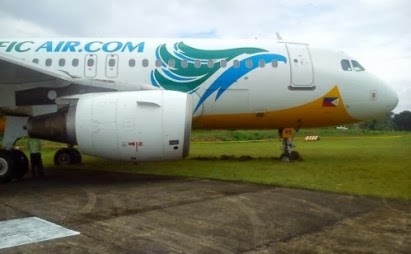 The Civil Aviation Authority of the Philippines ordered the airport of Butuan City shut down after a Cebu Pacific plane veered off the runway as it prepared for takeoff Saturday. In an advisory, Cebu Pacific said guests on these flights have two options: a free rebooking of their flight within 30 days from the original departure date, or be rerouted to the nearest alternate airport, which is either Cagayan de Oro or Davao. The CAAP notice to airmen said the nose gear of Cebu Pacific flight 5J 220 went off Runway 30 and got stuck on the muddy shoulder as the plane was turning in preparation for taking off for Cebu City. The passengers safely deplaned and were being re-accommodated on other flights. Sunday but maybe lifted earlier once the situation improves. The Airbus A319 jet with registry RP-C3195 was grounded and CAAP dispatched aircraft accident investigator Anthony de Arca to investigate the incident. None of the plane’s 106 passengers and crew was hurt. The closure of the airport is originally scheduled to run until 4 p. m.